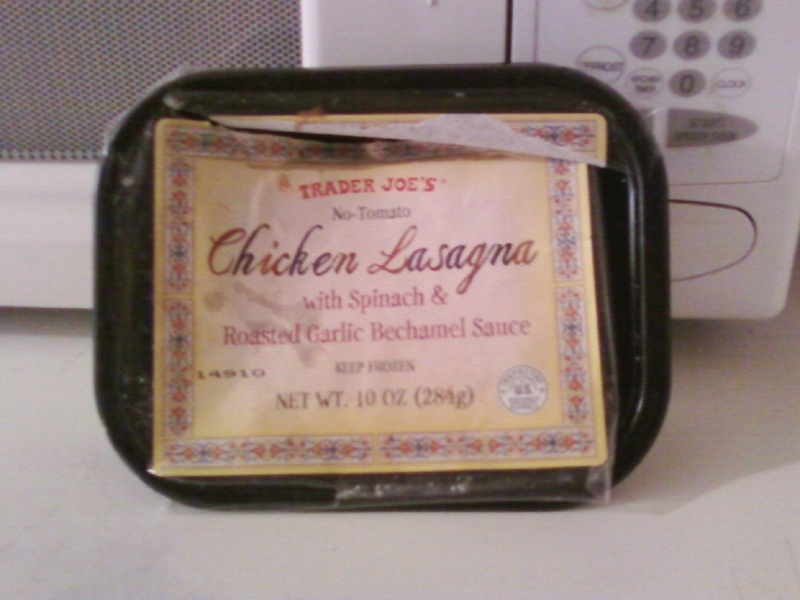 I hate to start this blog off with a negative review, but as fate should have it, I ate this Trader Joe's Chicken Lasagna today for lunch and was not impressed. Sonia tried the same lasagna last week and warned me that it was quite bland. She didn't even finish hers, which is not like her at all. She's not one to waste food, simply on principle. There are starving children in Africa. Anyway, this lasagna is virtually devoid of flavor. It boasts "No-Tomato" on the label. Well, friends, if God didn't want lasagna to have tomato, he would have banished the enigmatic fruit/vegetable from the nation of Italy back when the usually-delicious pasta dish was being developed some centuries ago. But of course vine-ripened tomatoes thrive in the lush gardens of Mediterranean countries, and are, therefore, an essential ingredient in many Italian dishes. I found myself pining for the taste of tangy tomato sauce so greatly, that I raided our miscellaneous drawer for some leftover hot sauce and salsa packets from various fast food restaurants. After adding them, I found the flavor much improved, and was able to finish the dish. Now, in the lasagna's defense, I did prepare mine in the microwave, not in the oven. The label does say microwaving is a viable option, however we all know things generally come out better when cooked in the oven. I'll be honest...I don't know what Bechamel sauce is. It is apparently green, mushy, and flavorless, save for a hint of garlic. 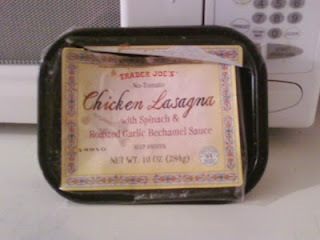 Furthermore, I could detect neither the taste nor the texture of chicken in this so called "Chicken Lasagna." If there was chicken in the food, it was evidently pureed beyond recognition, and somehow sapped of all indigenous flavor. I will say the lasagna feels pretty light...my stomach is not in agony, nor do I have any weird aftertaste haunting me, reminding me of the experience...I do not remember the price of the item. Somewhere in the ballpark of $3, I believe. With all of the delicious items TJ's has to offer, I do not recommend trying this one unless you're really desperate for something new. Two out of Five Stars from Nathan...One out of Five Stars from Sonia. Bottom line: 3 out of 10. I am currently enjoying this lasagna for lunch. I quite enjoy it. The bechamel (a white sauce) is pleasantly flavored with roasted garlic, though there isn't a discernible spinach flavor. The chicken is ground meat, but I've gotten multiple chunks throughout. It is a bit greasy and could use a bit of ground pepper, but I'm a fan of this lasagna. Sorry yours wasn't as enjoyable.